Unable to write effectively but unable to remain silent, W.G. Sebald, like the narrator of The Emigrants, is condemned to speak unsatisfactorily. “Not infrequently I unravelled what I had done, continuously tormented by scruples that were taking tighter hold and steadily paralysing me. These scruples concerned not only the subject of my narrative, which I felt I could not do justice to, no matter what approach I tried, but also the entire questionable business of writing.” This is the narrator of W.G. Sebald’s The Emigrants, and his stuttering, paradoxical lament, placed midway through the very story to which it cannot do justice, is a fresh unraveling: It undermines the book we are reading, which we now suspect to have failed, but it also defies its own prognoses for itself. In this way, even Sebald’s modest success—he has written a book he deems unwritable—is presented as a sort of failure. Unable to write effectively but unable to remain silent, Sebald, like his narrator, is condemned to speak unsatisfactorily. The narrative in question, one of the four novella-length pieces that make up the masterful Emigrants, is a biography of a fictional painter named Max Ferber, a German expat whose parents perished in the Holocaust. (The character is modeled on the German artist Frank Auerbach, now a longtime citizen of the United Kingdom.) Like Sebald, Ferber works uncertainly, wavering between creation and destruction. He paints, then erases, until the vague beginnings of human shapes tentatively emerge, “evolved from a long lineage of grey, ancestral faces, rendered unto ash but still there, as ghostly presences, on the harried paper.” Ferber experiences the urge for artistic creation as a kind of compulsion. He cannot fully renounce it, nor can he fully countenance it. Instead, he regards his work as a series of incremental advances toward an impossible end. The link between artistic creation and failure is intimate in the best of cases, but nowhere is this sense of inadequacy more acute than in literature or art about the Holocaust, which erects, by its own lights, a series of failed monuments to an event that is fundamentally illegible. To memorialize a tragedy, one must inscribe unmistakable significance into reticent materials, attempting to curb the natural processes of forgetting and obsolescence. In this way, acts of aestheticization are exercises in misrepresentation, requiring us to arrange neutral resources into artificially beautiful or meaningful configurations. But can we misrepresent without also misleading, mangling? These questions rightfully obsess a generation of postwar German-language writers and artists, most notably the author W.G. Sebald, who was born in 1944 in Bavaria and died in the UK in 2001, and the visual artist Anselm Kiefer, born one year later in the neighboring state of Baden-Württemberg, and since 1992 a resident of France. “Beyond a certain point, pain blots out the one thing that is essential to its being experienced—consciousness—and so perhaps extinguishes itself,” Ferber tells the narrator of The Emigrants. Hence his fixation on forms that strain to delineate themselves from an undifferentiated mass of paint, which are not unlike the memories he can barely distinguish from a deluge of half-recalled detail—retroactive reconstructions never quite suited to the immediacy of their content. Like Ferber, Kiefer disfigures his canvases, challenging contorted human forms to escape from a mass of impasto. The results, displayed in a stunning retrospective at the Centre Pompidou in Paris this spring, are as memorable as scars. Kiefer joins Sebald in asking how German artists are to publicize a war’s worth of pain, a matter of historical record that remains impossibly private. Horribly disfigured corpses lay everywhere. Bluish little phosphorous flames still flickered around many of them; others had been roasted brown or purple and reduced to a third of their normal size. They lay doubled up in pools of their own melted fat, which had sometimes already congealed…. When punishment gangs and camp inmates could begin clearing it in August, after the rubble had cooled down, they found people still sitting at tables or up against walls where they had been overcome by monoxide gas. Elsewhere, clumps of flesh and bone or whole heaps of bodies had cooked in the water gushing from bursting boilers. Other victims had been so badly charred and reduced to ashes by the heat, which had risen to a thousand degrees or more, that the remains of families consisting of several people could be carried away in a single laundry basket. Compared with this sketch of human devastation, Sebald’s strange, sad “fiction” is gently roundabout. His four “novels”—Vertigo, The Emigrants, The Rings of Saturn, and Austerlitz—are meandering, melancholic meditations on topics as diverse as deforestation, architectural history, seaside erosion, and silkworms. Dense with detail, neither fully factual nor fully fictional, they weave between the essayistic and the fictive in guarded, meticulous prose. They have the dreamy quality of childhood recollections, at once vivid and remote. Sebald’s gloomily Germanic narrators, who live in self-imposed exile in England (Sebald himself taught at the University of East Anglia for most of his adult life), are studiously historical. They relate events that have occurred, unalterably, outside and before the confines of their own lives, far beyond the bounds of the texts we are reading. The violence of these foregone events is reported second- or thirdhand to narrators who relate it, in diluted form, to us. By the time we learn about the atrocities Sebald’s characters have endured, they are already irrevocable. In The Emigrants, the narrator learns about his grade-school teacher’s depression and eventual suicide from Madame Landau, the teacher’s friend and sometime love interest: “thus, Mme Landau said, he had told her, only a few days after they had met, with an irony that made everything seem light and unimportant, of his recent attempt to take his own life.” Scenes like the ones recounted in On the History of Natural Destruction remain palpable but unspeakable, nested inaccessibly within a series of indirect quotations. Sebald’s fiction, which is so despairingly attentive to its own failures and so delicately threaded with lingering pain, is therefore not a variant of the cowardly silence he criticizes. But because the suffering he recounts is an embodied phenomenon with few surviving referents, he faces unique challenges. It is difficult to authoritatively revive a pain that no one is experiencing any longer: Most of the witnesses or victims of the violence of World War II are dead, and the few remaining survivors are no longer in the throes of their initial agony. Firebombings razed many of the more obvious architectural traces of Nazi rule. In place of human mutilations or ruined cityscapes, Sebald’s fiction offers up a different sort of physicality, rich with artworks (Rembrandt’s Anatomy Lesson commands a two-page spread in The Rings of Saturn), buildings (Austerlitz is an architectural historian obsessed with train stations), and antique bric-a-brac. But, as Sebald knows, the geography and stuff of our world are only tentatively bound up with the meanings we desperately assign to them. The narrator of Austerlitz complains that the Antwerp train station is inappropriately grandiose, “more suitable…for a state ceremony than as a place to wait for the next connection to Paris or Oostende.” It is a “profane” building, “a cathedral consecrated to international traffic and trade.” Austerlitz likes “railway architecture” because he “could never quite shake off thoughts of the agony of leave-taking and the fear of foreign places.” This fear is temporal as much as it is spatial. Fortresses—another of his preoccupations— amount to a kind of preemptive memorialization, the product of our pathological desire to “[surround] ourselves with defenses.” Fortification requires an allegiance to the present so willful that it compels us to defend against the possibility of an alternative future. But, as Austerlitz warns, “it is often our mightiest projects that most obviously betray the degree of our insecurity.” Worse, preventative measures often hasten the destruction and ruin they are intended to deter: “it had been forgotten that the largest fortifications will naturally attract the largest enemy forces.” So often these grand military structures turn out to be “a kind of wonder which in itself is a form of dawning horror, for somehow we know by instinct that outsize buildings cast the shadow of their own destruction before them, and are designed from the first with an eye to their later existence as ruins.” As they are transmuted into wreckage, strongholds designed to celebrate their own invincibility betray instead their own perishability. When Austerlitz visits Terezín, the site of the Theresienstadt concentration camp where his mother was murdered, he is reminded yet again of the tenuousness of the link between monuments and the acts or occasions they are meant to memorialize. The remains of the camp, which prove physically underwhelming, cannot do justice to its bloody history, and Austerlitz struggles to wrest meaning from the eclectic contents of a window display in the local antique shop: A white lace tablecloth and “three brass mortars of different sizes, which had about them the suggestion of oracular utterance,” seem “stranded.” “For reasons one could never know,” he tells the narrator, they “had outlived their former owners and survived the process of destruction.” Their pointless persistence is unjust, arbitrary. Why should the trivial detritus of human lives outlast the lives themselves? Are objects worth anything without their owners? Why isn’t Austerlitz’s trauma better linked to the materials that he finds, despite himself, unaffecting? Surveying Europe from the safety of a plane passing overhead, the enigmatic narrator of The Rings of Saturn observes that “no matter whether one is flying over Newfoundland or the sea of lights that stretches from Boston to Philadelphia after nightfall, over the Arabian deserts which gleam like mother-of-pearl, over the Ruhr or the city of Frankfurt, it is as though there were no people, only the things they have made and in which they are hiding.” Like Theresienstadt for Austerlitz, cities glimpsed from above are apparently neutral artifacts, arrangements in which it is impossible to detect any obvious marks of human habitation or history. And yet it is these mutable edifices—the train stations that Austerlitz studies, the museums that the narrator of The Rings of Saturn visits on his circuitous hikes across the English countryside, the crumbling seaside hotels frequented by the narrator of The Emigrants—that fascinate Sebald and his forlorn characters, precisely because they both conceal and reveal their residents, owners, and caretakers. Why does Sebald’s fiction take this tortured, halting route, circling the horrors of World War II without directly confronting them? Why does he create a confused melee of memorabilia, reminiscences, and residue rather than opting for the more conventional reportage he employs in On the History of Natural Destruction? (At various points in the collection, he even champions a direct approach, chastising his peers for their sentimentality.) We can ask the same questions of Kiefer, who eschews realistic representation in favor of stylized weirdness. What can the intensely subjective, opinionated paintings and photographic installations on display in the Pompidou accomplish that photographs—trusty agents of impartial documentation—cannot? In Regarding the Pain of Others, her monograph on wartime photojournalism, Susan Sontag observes that photographs appear to promise referential accuracy. Unlike paintings, they are causally validated by the scenes and people they represent, and for this reason they seem to be partial rehabilitations of obsolete objects, revivals of the dead: “because an image produced with a camera is, literally, a trace of something brought before the lens, photographs were superior to any painting as a memento of the vanished past and the dear departed.” Like the personal effects that Austerlitz longingly inspects in the Terezín antique shop, photographs have a tactile link to their erstwhile owners or subjects. To touch them, one might think, is to come into some sort of direct contact with a bygone event or person. I took all the pictures I have made since I started taking photographs and glued them onto lead ribbons. Like films, but it’s a paradox because the raison d’être of a film is to be transparent, to let light go through it to be projected. Glued on lead, these pictures are no longer viewable, visible. It is the exhibition of my life because they are photographs I took throughout my life, thousands of photos. And yet I hide them, it’s a cache. Unlike writing, which clarifies its agenda, photographs have the capacity to be decontextualized and thus appropriated: “whether the photograph is understood as a naive object or the work of an experienced artificer, its meaning—and the viewer’s response—depends on how the picture is identified or misidentified; that is, on words,” Sontag concludes. The truth value depends on how it is framed and phrased. If a story is aesthetically right, then it is probably also morally right. You cannot really translate one to one from reality. If you try to do that, in order to get at a truth value through writing, you have to falsify and lie. Sebald and Kiefer make art based on a precarious paradox. Bound to Germany precisely because they are estranged from it, they inhabit a place they have disavowed. Sebald, who finds architecture too neutral a vehicle to testify to suffering, is pessimistic about the prospect of repossessing tarnished German cities. Even the closest link between event and object, he reminds us relentlessly, doesn’t guarantee an effective representation. The solution is neither to eliminate the historical evidence, nor to preserve it in all its poverty, but rather to give structures a valence, an affect. But is this possible, when our buildings and belongings defy us at every turn? Kiefer, who works in the imagined spaces or nonspaces of painting and installation, takes up the paradox by circumventing the obstacles to the creation of meaning erected by the physical world. Like Sebald’s novels, his paintings depict resoundingly empty places: architectural ruins, bleak landscapes, vacant rooms. But unlike Theresienstadt or the Antwerp train station, these expanses, over which Kiefer exercises absolute control, are fraught with unmistakable significance. In a series of studies of savaged Nazi buildings painted in the early 1980s, Kiefer reconstructs Nazi monuments demolished in the firebombings, memorializing a landscape of which there is no remaining physical record. The paintings, which are rendered in dim tones and cracked textures, are united to powerful effect in a single room at the Pompidou. They are immense and desolate, not just uninhabited but inhospitable, darkening entire walls. In Sulamith (1981), a series of scorched brick archways stretch off toward a distant terminus. The furrows between the bricks are carved with wrathful violence into the canvas, like scratches, and the archways press with an oppressive insistence onto the conspicuous void at the heart of the work. The stillness of this image is so absolute that it makes noise and motion unimaginable, creating a sense of fixity so complete that it chokes us. These images, so palpably and heavily desolate, so immune to misinterpretation, are Kiefer’s rebuke to Albert Speer, the chief Nazi architect, who took Austerlitz’s theory of fortification to heart. According to Speer’s “theory of the value of ruins,” state buildings should be constructed with an eye toward how they’ll appear centuries hence, after they’ve crumbled. Speer’s buildings were therefore never anything but monuments to themselves, empty provocations: He memorialized the present until there was no present left to memorialize. Kiefer imagines a world in which Speer’s work perversely fulfills its intended function, but he thwarts the architect’s aims by transforming a hollow gesture into a meaningful one. Sebald often positions himself or his proxies as bodies moving through various spaces (in The Rings of Saturn, for instance, the narrator is on a walking tour), yet the landscapes they traverse are strangely ethereal, reduced to a series of free associations and reminiscences. 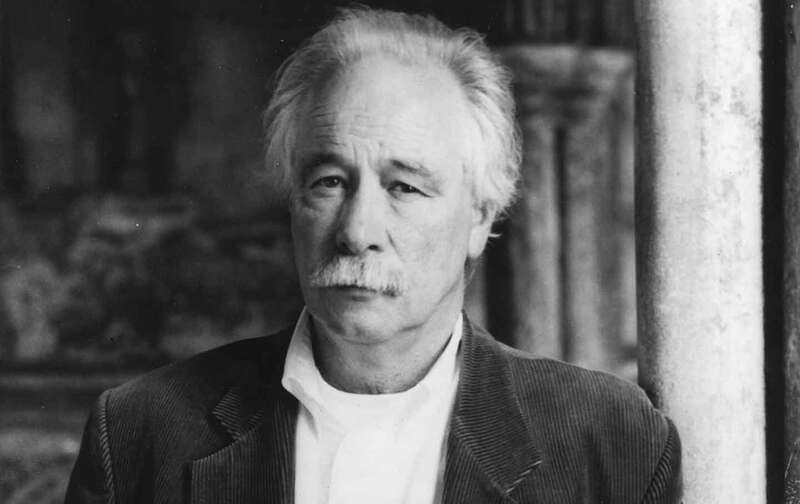 Sebald himself, the vacant narrator, is the ghostliest of all, both a presence and a nonpresence in his own texts—a haunting of a construction that invokes him only partially, an aphysical attachment to a physical space. Memorialization, then, is an attempt to entangle an object or space and a memory so thoroughly that they become inextricable. What is haunting if not the quintessential memorialization—the most dogged way of linking place and event, structure and meaning? Ghosts are what make mere buildings into monuments.